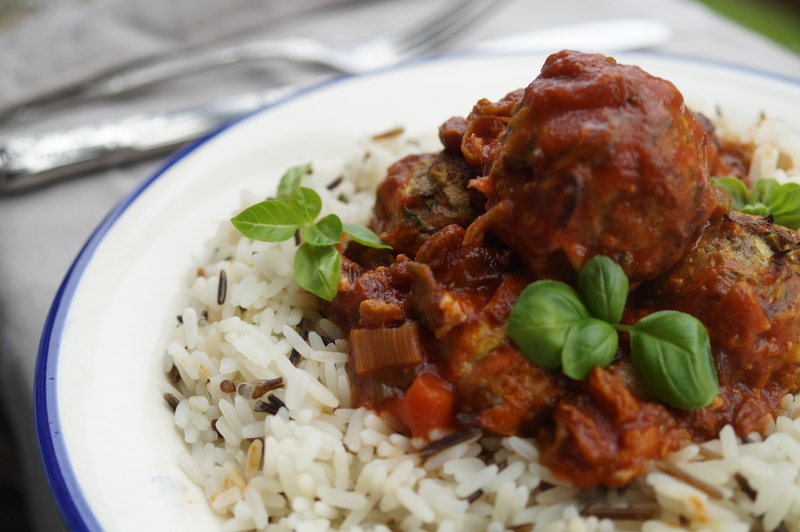 I really fancied making meatballs this week. Mostly because my Dad called me to tell me about some of the delicious meatballs he’s been making from one of Yotam Ottolenghi’s cookbooks. I was also inspired by the lamb patties we made at Tonia Buxton’s Total Greek Yoghurt masterclass. Normally when I make burgers or meatballs I’m a bit of a purist and like to make them from nothing but meat. However Tonia’s recipe contained egg and breadcrumbs as well as spices and it gave a really nice texture and kept the meat juicy. I used all my breadcrumbs last week for those fish fingers plus I wanted to try something a bit different. So, instead of bread I decided to throw a load of grated vegetables into the mix. 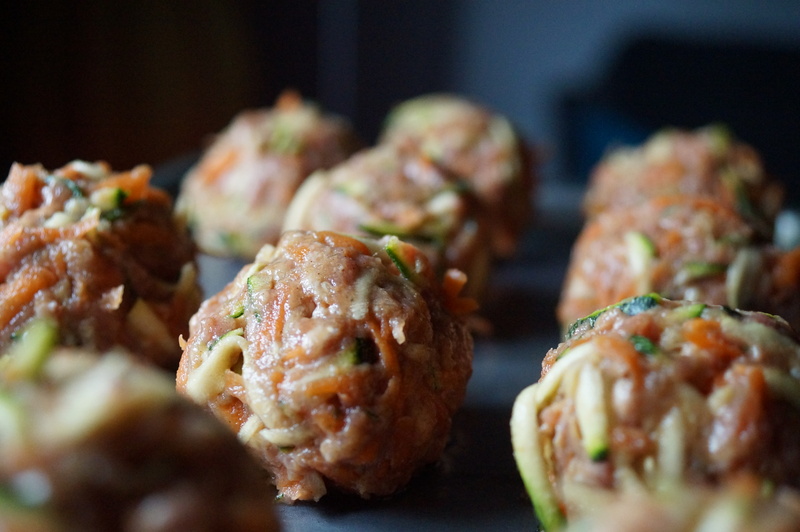 This really works because it makes the mixture go a heck of a lot further and I love the little flecks of green and orange running through the meatballs from the courgette and carrot – they look really quite snazzy! 1) Preheat oven to 190°c and drizzle the vegetable oil on a baking sheet. 2) Place all of the meatball ingredients into a large bowl and mix well with your hands. Really get stuck in squashing it all together so all the spices are properly mingled in with the meat and grated veg. 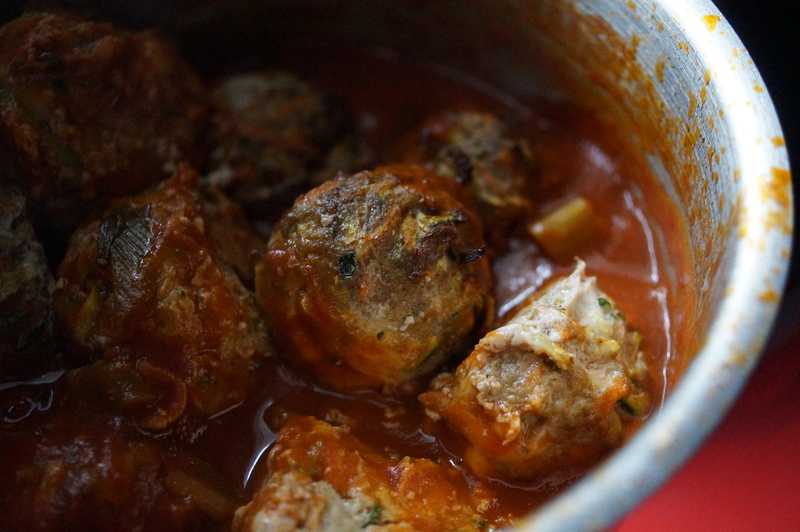 3) Once all the ingredients are really well combined divide the mixture into 10 and roll into meat balls. 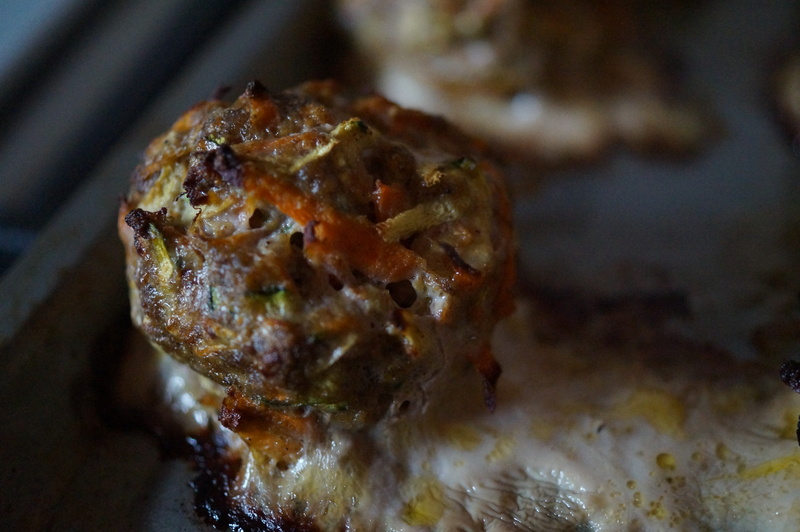 4) Pop the meatballs onto the greased baking sheet and cook in the preheated oven for around 15 minutes or until turning brown on the outside and cooked all the way through. 5) While the meatballs are cooking away stick the rice on to boil. I rinse my rice before I boil it and cook it in a pan with about 2-3cm of cold water on top. I bring it to the boil and then let it stay boiling for about 10 minutes. Then I put the lid on and turn the heat off and let it sit in its own steam for another 10 minutes…but everyone has their own tricks for rice – if in doubt follow the instructions on the pack. Chop the spring onions and fry them gently in the oil until they're starting to soften. 7) Stir in the crushed garlic for just a couple of seconds then add the balsamic vinegar, passata and water. 8) Throw in the sultanas and leave to simmer (stirring occasionally) for about 10 – 15 minutes or until it has reduced a little, you want it about as thick as the passata was before you added the water, if not just slightly thicker. Season to taste. 9) When the meatballs are done take them out of the oven and when you're happy with the sauce pop the meatballs into it and give them a stir round to give them a good tomatoey coating. 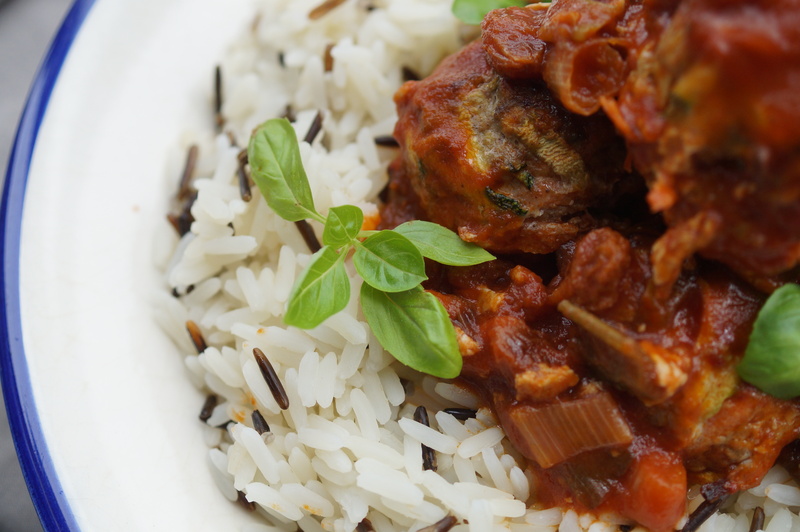 10) Serve your meatballs and tomato sauce on a bed of rice with a few fresh herbs scattered around or a cheeky grating of Parmesan cheese.